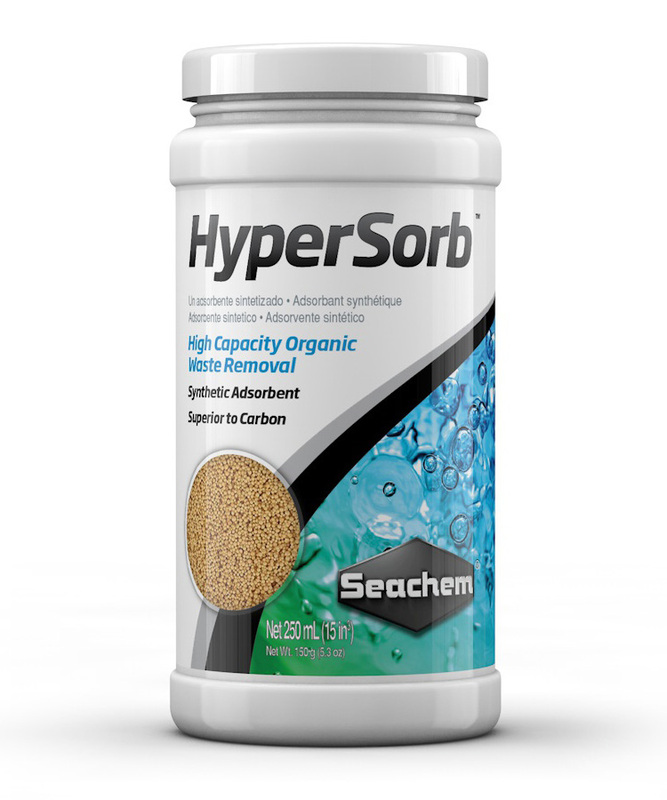 HyperSorb™ is a synthetic adsorbent that outperforms all other blended synthetic media and carbons. It has exceptional organic removal capacity: it removes organic waste, toxic vapors and other pollutants. In freshwater it will help stabilize the ionic balance and will help control ammonia, nitrite, and nitrate. It is easily regenerated with household bleach. For use in both freshwater and marine. Use in a filter bag such as The Bag. Each 250 mL treats up to 300 L (75 US gallons). Rinse before use. 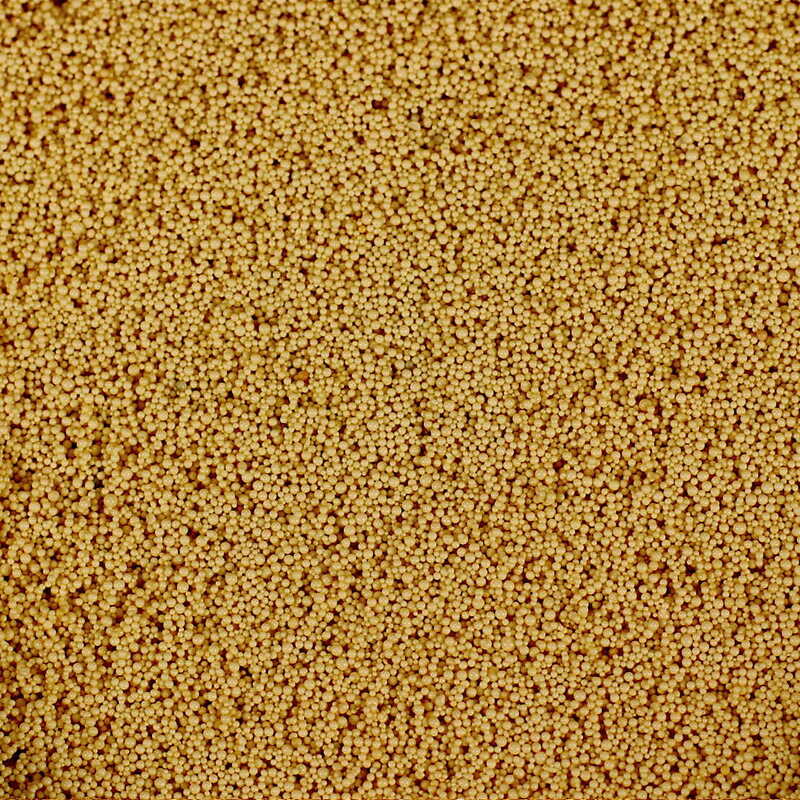 Exhaustion is indicated by a pronounced discoloration of the beads from yellow to deep brown. REGENERATION: Soak in a 1:1 bleach:water solution for 24 hours in a non-metallic container in a well ventilated area and away from children. Use regular 8.25% hypochlorite household bleach (non-scented, no dyes, do not use a splash-less bleach). Rinse well, then soak for 8 hours with a solution containing 4 tablespoons of Prime®, or equivalent dechlorinator per cup of water. Rinse well. For freshwater use, soak for 4 hours with a solution containing 2 tablespoons of buffer per cup of water (Discus Buffer®, Neutral Regulator®). Original color and full activity should now be restored and HyperSorb™ is ready for reuse. Caution: some slime coat products may permanently foul HyperSorb™ and render regeneration difficult. Do not reuse if odor of bleach/chlorine is detectable. In case of doubt, soak beads in small quantity of water and test for residual chlorine with a chlorine test kit. Q: I've found this product to be absolutely superb at swiftly lowering phosphate and nitrate levels, however, I'm uncertain if I can use it to remove these ions in a blackwater system, since the product also claims to remove 'other organics'. Would tannic acid be one of organic molecules it removes? A: I would continue to use Hypersorb as any other resin or carbon will be more aggressive at removing the tannins, colors, etc. Because of that, Hypersorb would be my first choice. My second choice would be Renew which we sell as an economical and less aggressive alternative to carbon. 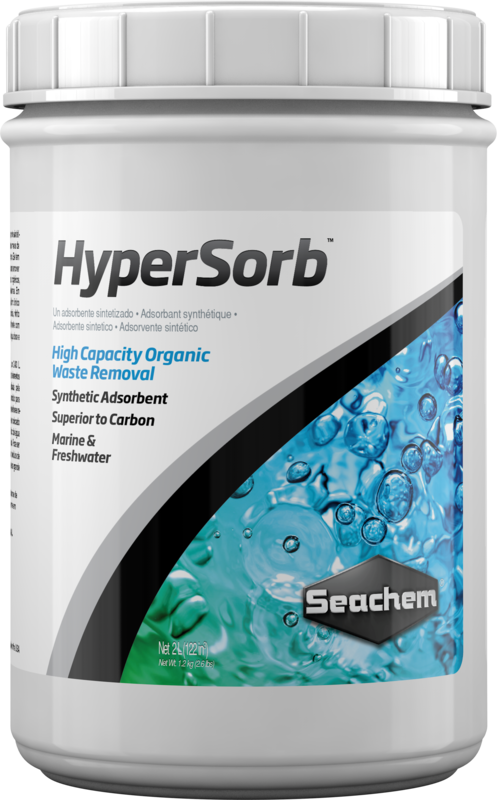 Q: Would it be better to use HyperSorb or Purigen in a reef aquarium? A: I would definitely prefer Purigen over Hypersorb because Purigen has a much greater capacity for organic removal in salt water than Hypersorb. Q: Can you use Seachem's The Bag as the filter bag for Hypersorb in the bulk form? A: Absolutely, The Bag is designed to hold all of our chemical filtration medias, including Hypersorb. It will also stand up to bleach and acid when necessary to regenerate our resins. Q: I set up a tank with HyperSorb as my filtration media and my turned an orange/brown color. Am I using too much HyperSorb? 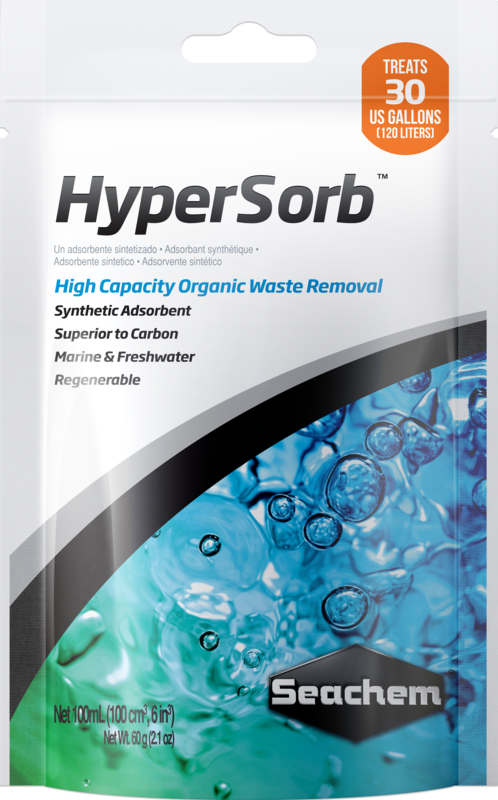 A: HyperSorb is an adsorbent media/resin that is incapable of leaching anything into the water column. The orange (brown?) shade you speak of could possibly be due to the leaching of organic acids by driftwood, peat, or other organic material if present in your system. If it is a new aquarium, it could also be a bacterial bloom due to an establishing biological filter. 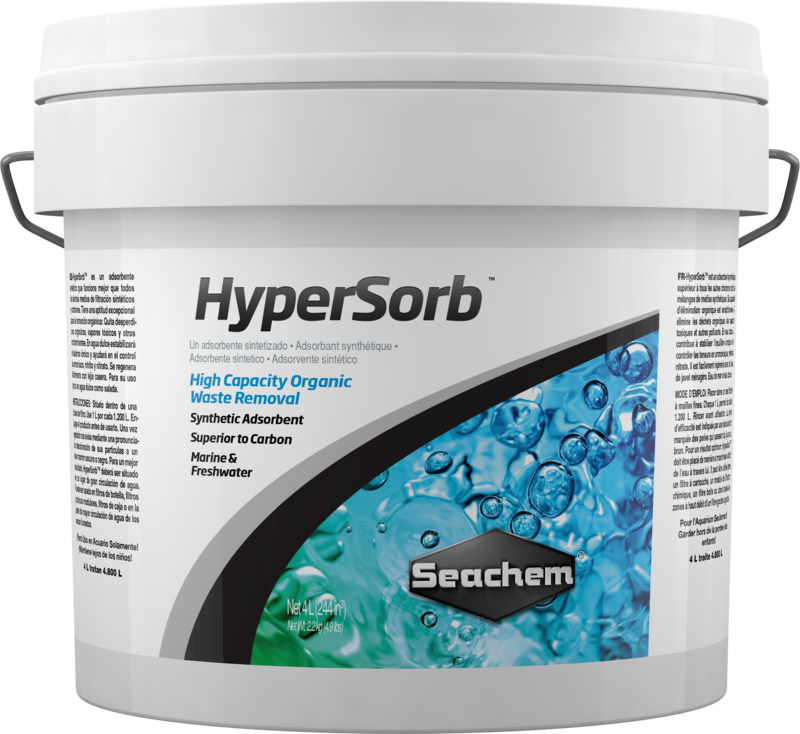 HyperSorb should not need to be rinsed prior to use.